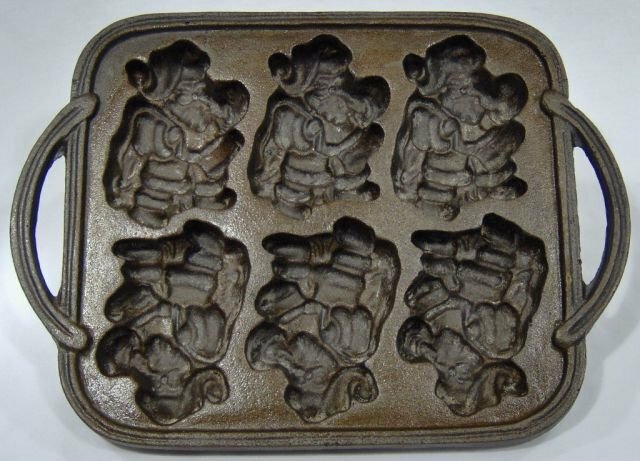 This cast iron Santa Claus cookie mold is just right for baking old fashioned treats. Cast iron is the choice of seasoned bakers. It holds the heat of the oven to guarantee even and consistent results. This mold is about 10 1/2 inches by 7 1/2 inches. It makes 6 Santa Claus cookies, each about 3 1/2 by 2 1/2 inches. Remember, it's cast iron so it's heavy. Contact us about shipping and we'll work-out the least expensive shipping method.